Birkenhead 10 entered service in January 1958 with Birkenhead Corporation Transport. 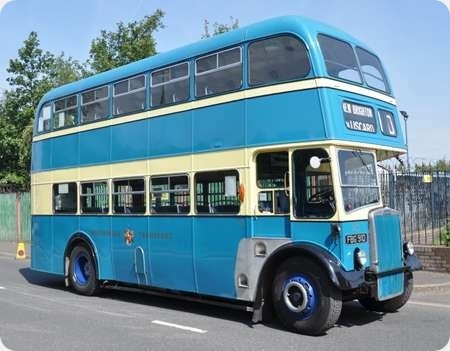 It has bodywork by Massey Brothers of Wigan which had been a major supplier of bus bodies to Birkenhead for various chassis since 1931. From 1957 to 1967 Birkenhead had almost totally standardised on the Leyland PD2s with Massey bodywork. Although there were inevitable changes in body design, there where essentially only two external appearances of body. The later design that had a more upright front profile is shown on the Wirral Transport Museum’s Birkenhead 152. In 1969 10 passed to the Merseyside Passenger Transport Executive (MPTE) where it served until February 1974. Although out of public service, 10 then spent a further six years of service in the driver training school. In 1980 Birkenhead 10 became part of the 201 bus preservation society. It is seen at NWVRT open day in June 2014 at Kirkby. Just a classic. Nothing more to say. I’ve always felt Massey’s bodies to be a bit of a mixed bag, in terms of some designs, but this one can’t be faulted. The Wirral was very colourful in this era, what with Birkenhead and Wallasey Corporations’ cheery liveries. The epitome of a British municipal bus. Straightforward chassis and body design coupled with a superb and tasteful livery. The fleetname and crest show a high degree of civic pride that existed with most municipals in those days. Also a clear and easily legible destination display with no need for the bus to be daubed in route branding graffiti like today. Sheer class. Class indeed, and what a sight it used to be at the Woodside Ferry terminal to see dozens of these lined up, always looking smart, with the dull green Crosville buses terminating farther up the hill. I remember you could get off a bus (or a ferry) at Woodside and catch a train from Woodside Station to London Paddington. Now it’s all gone.